Born in Brooklyn, Alphonse Capone began his career with two gangs, the Brooklyn Rippers and the Forty Thieves Juniors, before becoming a waiter-bouncer at Frankie Yale’s Harvard Inn on Coney Island. It was while working here in the summer of 1917 that he received the injury that would lead to him being called “Scarface” (although never to his face). Frank Galluccio slashed Capone’s face, avenging over familiarity with his sister. Capone joined Johnny Torrio’s gang and took over in January 1925 when Torrio retired. Capone called his organization The Outfit band they dominated bootlegging, prostitution, gambling and protection rackets in Chicago. By the end of the 20s Capone’s annual income was said to be $100 million and he didn’t pay a penny in income tax. He was listed in the Chicago telephone directory as “A. Capone, Antique Dealer 2200 South Wabash Avenue”. On 20 September 1926 Dion O’Banion’s mob tried to kill Capone by shooting up his Hawthorne Hotel headquarters. Capone paid for repairs to buildings and cars that were damaged nearby. Three years later he arranged to have his rival wiped out in the St Valentine’s Day Massacre (search the article). In May 1929 he was sentenced to a year in prison for gun possession. In 1931 he was charged with tax evasion for not declaring $215,000 back taxes on profits from gambling. Believing he could plea bargain his way out, Capone pleaded guilty but Judge James H. Wilkerson refused to make a deal. Capone changed his plea to not guilty and tried to bribe the jury. Judge Wilkerson changed the jury at the last moment and Capone was found guilty on five of the 23 charges, sending him to federal prison for ten years and the county jail for one. He was also fined $50,000 plus $30,000 in costs. In prison Capone furnished his cell with a typewriter, rugs and a complete set of the Encyclopedia Britannica. His organization meanwhile flourished under the leadership of Frank Nitti. On 22 August 1934 he was transferred to Alcatraz but spent much of his sentence in hospital where he was suffering from syphilitic dementia. 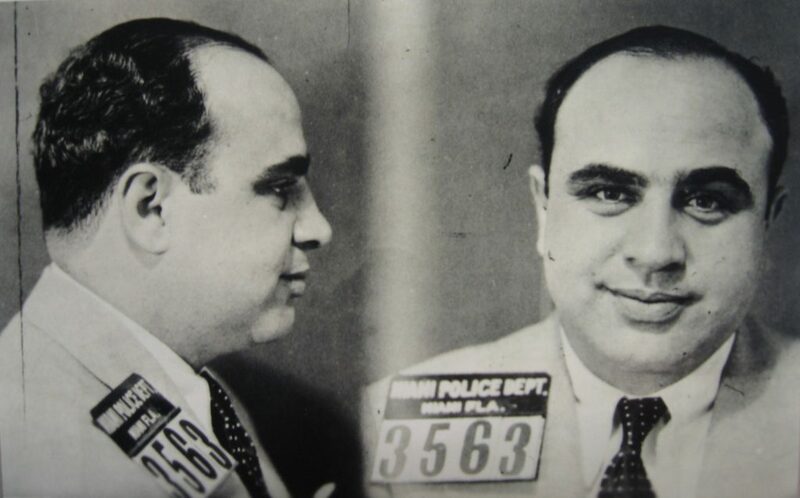 Capone was released on 16 November 1939 but his worst days were behind him because of the syphilis (caught by sleeping with the prostitutes he owned). Capone died of a heart attack on 25 January 1947, four days after suffering an apoplectic stroke. It was thought he had ordered the deaths of 500 men and 1,000 more died in the turf wars.